R & S Powersports Group is a leading company that provides outdoor entertainment in the form of motorcycle racing, personal watercraft, ATV and many others. 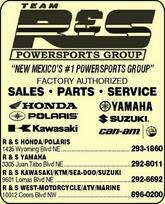 R & S Powersports Group owns stores in Albuquerque in New Mexico which have a wide variety of pre- owned and new vehicles. It also has a wide variety of ATVs, sports boats and personal watercraft and motorcycles. R & S Powersports Group also offers parts and accessories and it has a service department that is equipped to work on jet boats, motorcycles, personal water crafts and ATV. The company is based in Albuquerque in New Mexico. There are currently 0 consumer reviews about R & S Powersports Group available. Share your review. Please take a note that you are about to post a public review about R & S Powersports Group corporate office on CorporateOffice.com. This review will be public, so please do not post any of your personal information on this website. If you would like to contact the corporate offices of R & S Powersports Group, please use their contact information such as their phone number, website, and address listed above to contact them. However, sometimes staff from R & S Powersports Group headquarters do read the reviews on this website.